This week the weather gave us average temperatures with the exception of a 36-hour cold front preempted by a few thunderstorms. This did cause a disruption in the fishing patterns but most adjusted and had some good fishing as you will see below. Bob & Ollie Waldeck from Cotter, AR returned for their 5th consecutive year. 1st day was very productive catching some Smallmouth up to 17.5”. 2nd day was slower but got some advise from another guest. 3rd & 4th day they fought some windy conditions but still caught some good SB. 5th day was a very good Smallmouth Bass day catching some sizable fish along with numbers. 6th day had some great Northern Pike fishing catching about 30. During the rest of their 14-day stay they had several days catching 20-25 Northern Pike, another landing 28 Smallmouth Bass, Bob catching a 19” Trophy & on the last day they finished with a bang catching 39 fish, mostly Pike plus Ollie caught a very large 18” Trophy Smallmouth Bass. Both thoroughly enjoyed their stay and before departing made their reservations for 2017. 19-year guests Al Fishhaber and fishing buddy Rob Delamatre from Northfield & Sandusky, OH were back to chase the BIG Dogs. 1st day they went to it catching over 50 Northern Pike, Rob catching a good number on his fly rod. 2nd day they focused on bigger Pike landing 20 during the day & 20 after supper. 3rd day had them catching 50+ northern Pike. 4th & 5th days were BIG Numbers catching well over 100 on one day a slightly less on the other day. 6th and final ½ day, as they got an early start on the road, they caught some nice size Pike to finish off their trip. Long Time Return guests Chris Grimes & Bob Fischer from Thurmont & Frederick, MD bringing a good friend Skip Johnston for his 1st time and Chris brought his son Hunter for his first Canadian Wilderness Fishing Experience. DOA Chris & Hunter each caught a trophy Smallmouth Bass. 1st full day was a group total of over 100 Northern Pike and Chis landed a 19” & Hunter had his 2nd trophy in 2 days at 18.5”, with Bob also catching a 19”er. 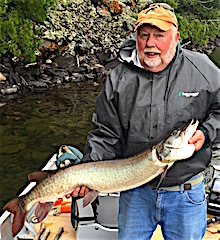 3rd day Bob said at 2:00PM it was like the switch was turned on catching over 50 SB in just a few hours & Bob also caught a Muskie. 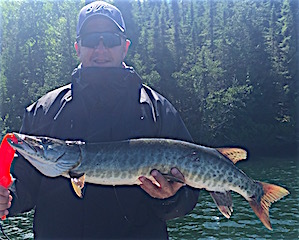 4th day had Chris & Hunter Muskie fishing until noon, with Chris landing 1, but then Hunter got hot on Little Vermilion Lake catching 8 Northern Pike in a row 30 to 35 inches. 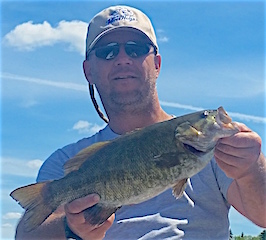 5th day was a super day fishing, as a group catching well over 200 fish with Hunter landing a special 20” Trophy Smallmouth Bass. 6th & final day was searching for a Trophy Muskie in the 50” class Chris had seen the day before, but it was not meant to be. All left having a great time, with Chris already discussing 2017 plans. Lyle having many Muskie follows & Nate caught his very 1st Muskie ever. 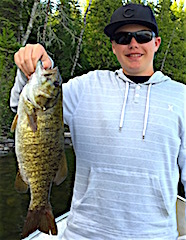 The Noblett family caught both Pike & Smallmouth, Katie landing another big 17.5” Smallie. 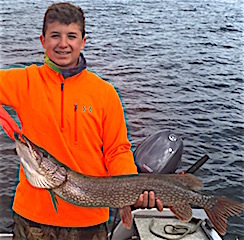 3rd day they were fighting a cold front with high winds making fishing difficult however the 4th day was gangbusters with the Noblett family catching 103 fish, mostly Pike, Nate & Lyle catching more Northern Pike than they could count, with Adam & Will having a great day Fly Fishing for Pike. 5th day had Stacey, Traci, & Katie spending the 1st half day enjoying the Twin Falls area & the other half day catching 60 Pike & 7 Smallmouth Bass with Traci landing a Trophy at 18”. Nate & Willy caught near 100 Northern Pike and Adam & Lyle caught many fish Fly Fishing with Adam landing a Muskie and big 36” Pike. 6th & final day was wonderful as all caught fish with Lyle catching the fish of most peoples lifetime as he landed a HUGE 44” Tiger Muskie. All went home with many memories, which is the biggest catch of all. Father & son Erik & David Staub from Greeley & Denver CO were back for their 2nd visit. 1st day was a good day Pike fishing, also doing well catching 15 fishing for our canoe in the evening. 2nd day we had very turbulent weather affecting the fishing but they still caught & had the opportunity to catch a few BIG fish, with David losing a HUGE Smallmouth. Windy cold front conditions were the story on the 3rd day. 4th day was Great catching over 40 Northern Pike almost all Fly-Fishing. 5th day was a portage lake adventure having a ball catching some nice fish and enjoying the serenity of being on the only fishers on the lake. 6th & final day in search of large fish they saw plenty having opportunity, however on this day the fish won. They left making some wonderful father & son memoires. number of large Northern Pike with Jordan catching the largest. 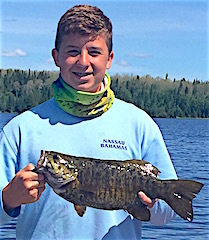 The final two days had a number of T-Storm moving through, limiting fishing time, catching a mixed bag of Northern Pike & Smallmouth Bass with Jordan catching another 18” Master Anglers Award Smallmouth Bass a & Kerry a HUGE 19” Trophy. All had loads of fun as a family making priceless memories & we thank them for choosing Fireside Lodge for this special family time together. Father & Son David Ziletti & Son Henry returned for their 2nd time and with them for their 1st was Matt Schaefer & Matt Jr all from Powhatan, VA. 1st day all caught fish & Matt / Matt hit a special time at around 2:00PM where the Smallmouth Bass just turned on and they had a flurry of action for about 2 hours. 2nd day it really picked up for this crew catching over 40 Northern Pike on suspending stick baits. Most of the 3rd day was spent fishing for Muskie having many follows & Matt Sr landed his 1st ever Muskie plus they also had good Smallmouth fishing catching bigger fish including Henry landing a HUGE 19” Trophy. 4th day was unreal as they caught over 120 fish most Pike plus SB 20,19, & 18 inches with Henry landing the 20”er. 5th & final day was hindered by all day T-Storms, but all left having had a terrific fishing trip making many father & son memories. Guest since 1995 Lloyd Morton returned with grandson Cole from Lawrence, OH for his 3rd trip. 1st day they were searching for Smallmouth Bass but found out that they were a little off as it was the time period just after leaving their nests. 2nd day was targeting larger Toothy Critters getting a lot of follows & catching 9 Pike 28-32-inches.3rd day was amazing catching 50+ Northern Pike by noon. 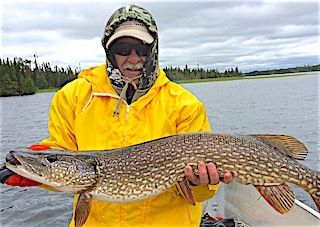 4th & 5th days were good, catching many bigger Northern Pike on a new lure Lloyd purchased at my tackle shop. Lloyd landed a 32” & 40” Muskie plus Cole caught an 18.5” Trophy Smallmouth Bass. Both left having a great trip and making special lifelong memories between Grandfather & Grandson. Long time guest since 1993, David Drake from West Terra Haute, IN was back with his good friend Dan for his 1st experience. 1st two days were hampered by very windy conditions & cold front conditions making finding fish tougher catching only 1 or two fish in a spot so the had to keep moving to be productive. 3rd day was great getting into 40+ Northern Pike, having great action all day. 5th & final day brought another cold front however the Smallmouth fishing was good most of the day, plus they caught some nice Pike with Dan getting the prize catch landing a fat 36” Northern Pike on lite line, a #4 hook & no leader. It took a long time but Dan managed to land this fish. Both left having a very enjoyable stay. Father & son John & Matt Boecker & Chuck Boecker were fishing with us for their 1st time. 1st day on the water with windy cold front conditions these 3 caught 12 SB & 12 NP. 2nd day was windy cold front conditions but the did well fishing again catching a mix of Smallies & Pike. 3rd day was a portage catching so many Northern Pike they could not keep count. 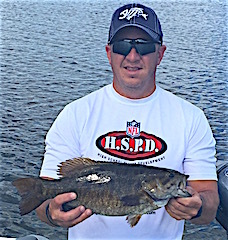 4th & final day was another great day fishing catching many Northern Pike & Smallmouth Bass & Matt caught the prize fish of the week landing a HUGE 20-inch Trophy Smallmouth Bass. Fun was had by all along with making many family memories. First timers Donn Loy, Tom Wiersema, & Doug Richardson respectively from Kearney, NE, & Laramie & Casper, WY went out the first day and caught 9 fish with Don landing a large 18.5” Smallmouth after supper stetting the bar. 2nd day was fabulous as they caught well over 50 Northern Pike & a few SB. 3rd day was a good day Smallmouth fishing getting some good action on surface poppers with a mix of sizes up to 17.5 inches. 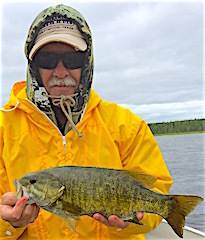 4th day was great action on Smallmouth with surface fishing being the ticket again catching many 15-17.5” & Doug caught an 18” Trophy Smallmouth Bass the only way he knows how, Fly-Fishing. 5th & final day was a fabulous finish as they caught 40 plus fish, mostly Pike with a few Smallmouth Bass & Doug caught a BIG 19” Trophy Smallmouth Bass Fly-Fishing. All left as high spirited as the arrived saying they had a fabulous fishing trip. Father & sons Bill, Jeff, & Mike Kengor from Pittsburgh, PA returned for their 3rd time. DOA before supper they caught some Pike & Bass with Jeff catching his personal largest Smallmouth Bass measuring out at 21-inches. 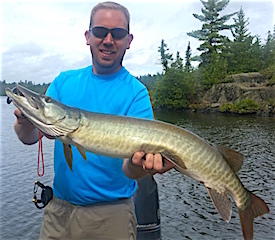 1st day was all about Muskie fishing having opportunity with follows but could not land a fish. 2nd day they did great catching countless Northern Pike plus a few Smallmouth Bass. 3rd day was a portage for some walleye for half a day and even thought the walleye fishing was slow they caught many pike. 2nd half day they got into some bigger Northern Pike. 3rd day they caught 50+ northern pike & Mike caught a Monster 19” Smallmouth Bass, which they said was so fat it, was almost square. Mike said it was the BIGGEST Smallie he had ever seen. 4th & final day was spent looking for large toothy critters & Jeff had the opportunity but the fish won. All left having another great father & sons fishing trip, making great memories together.